Hi, Everyone – it’s time to engage once again with my favorite new book. 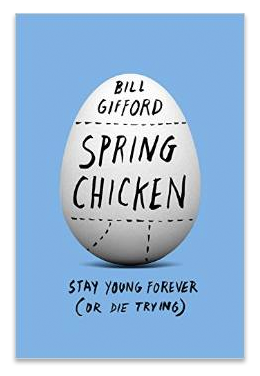 This time the topic is aging, but in this book, Spring Chicken: Stay Young Forever (Or Die Trying), you’ll find counterintuitive approaches that happen to be evidence-based. It’s chock full of page-turning stories and wicked humor. I enjoyed it so much that I asked the author, Bill Gifford, to answer a few questions, which you’ll find below. Of course, you’ll gain much more from the interview if you read the book first, but if you haven’t decided to one-click it on Amazon, hopefully the interview with spur you into purchasing Bill Gifford’s book now, before your aging brain forgets to complete the task! Dr. Sara: What was most surprising, confusing, and/or unresolved in your quest to discover the secret to longer healthspan? Bill Gifford: The biggest unresolved issue is also a fundamental one: How do you measure aging? That is, how do you assess someone’s biological age, versus their chronological age? We’ve spent millions of dollars trying to answer this question, and yet we have no clear idea. There is no one biomarker, or set of biomarkers, that will give you your “real age.” That’s why I don’t trust “anti-aging” doctors—how can you claim to be reversing aging, when you don’t even know how to measure it? Dr. Sara: What are the Germans doing right? On page 16, you state that half of German kids born this year will live to 105. Any thoughts or data on what they’re doing differently? Less sedentary? Less high fructose corn syrup? More settled philosophy? Bill Gifford: That’s a prediction from the demographer James Vaupel, who is known as a bit of an optimist in his field. It’s possible, certainly. And contrast that with the US, which ranks somewhere around 40th worldwide for life expectancy, despite spending vastly more on healthcare per person. The big differences are that the Germans have universal healthcare, so poverty and inequality are not the major health issues that they are in our society. The US has been described as a Third World country inside a First World country, and one thing that is true is that wealth and education are very powerful anti-aging drugs. In the parts of our country that have less access to healthcare and education, life expectancies are going down for the first time maybe ever. In Germany, also, definitely see more people walking and riding bikes than you do here, where we’re all slaves to our cars. There is no one biomarker that gives your real age. How can you reverse aging without knowing how to measure it? Dr. Sara: I loved the contrast of Jay Olshansky and Aubrey de Grey in chapter 2. Both seem mildly insane. You mention the hot dogs about six times, and the incongruity seems fitting with Olshansky’s skepticism about the benefits of lifestyle change. Here’s my question: do you eat hot dogs? More to the point, how do you walk the line between the evidence on aging and enjoying your life? Did you change any of your behaviors as a result of your synthesis for the book? Bill Gifford: I think it’s important to live a fun, full life, and not obsess too much over doing everything “right” so you live forever. Because guess what? You won’t. In fact there are many examples of longevity-obsessives who died relatively young. So, to answer your question, I probably eat about a dozen hot dogs a year, and an equivalent number of hamburgers (grass fed or house made, only). But by and large I mostly eat fresh food that I cook myself, almost nothing that comes from a box, no sodas, and no fast food except Chipotle. While I was writing the book I rededicated myself to cycling, an old passion, and I actually lost weight. I ride twice a week with a fun group of guys, and afterward we go and undo all the benefits by drinking a bunch of beer. It’s well worth whatever it might cost me in terms of life expectancy, I think. Bill Gifford: I’m sort of a student of the history of science, and it’s always been important to have people like Aubrey, standing out on the fringes and sort of shouting and gesticulating madly. The mainstreamers think they’re insane, but often (and eventually) they turn out to be right. The trouble is that he has a record of saying crazy things, like that humans could possibly live for 5,000 years. If you read the fine print, you realize that this would require a wholesale re-engineering of cellular biology (and 2 billion years’ worth of evolution), so it doesn’t seem bloody likely at this point. But who knows? I sort of skimmed over Aubrey’s work in my book because it did not seem to be terribly applicable in the near term, but in the long run some of the things he’s been saying could well come true. Dr. Sara: Dr. Jeffrey Life chooses his abs over alcohol. I understand the data on red wine consumption and alcohol, but can’t quite believe it, particularly the study from Bordeaux showing wine consumption is linked to a risk reduction of 0.5 for Alzheimer’s Disease. I’ve heard elsewhere that the French methylate better than Americans, and that they have about a 2% mutation rate in MTHFR versus 66% in the US. Perhaps the French genome and expsome is superior for wine consumption compared with ours? Bill Gifford: The trouble with those big studies is that their conclusions are all associational, not causal. And, obviously, wine or whatever is not the only relevant variable. That’s why it’s so hard to study diet in actual human beings: There are so many potential factors at play, including the fact that we mis-remember (and lie), particularly when it comes to food. So who knows: It could be their high-fat diet, which is coming back into scientific vogue. Thirty years ago, carbs were king—we were all supposed to eat tons of grain, and pasta. Now we’re realizing that that’s a good way to get diabetes, and that we really should have been eating more fat all along, like the French. And to be clear, the people with the most protection vs. Alzheimer’s were the ones drinking three to five glasses per day! Which can’t be that good for you. Dr. Sara: Did BLAST measure your telomeres, or has Luigi decided against telomere measurement, perhaps for some of the reasons you’ve cited? Do they share with you results of genome testing, and is one of their goals to quantify wellness (similar to Lee Hood in Seattle)? Bill Gifford: Telomeres are a tricky thing to measure. They vary in length from tissue to tissue, so the typical test measures them only in blood cells. Your liver cells might have longer or shorter telomeres; it’s hard to tell without a biopsy (which the BLAST did not do, thankfully). The role of telomeres in aging is very controversial, but most of the people I spoke to think that short telomeres more a symptom of other things that are going on, from chronic disease to deep psychological stress. Dr. Sara: What supplements do you take? Were they chosen based on the results of your book research and synthesis? If you got genome testing, did that otherwise change your lifestyle choices, e.g., taking higher doses of vitamin D or active B vitamins, or heading to CrossFIT? Bill Gifford: I’m not opposed to supplements that are backed by sound research. I take Vitamin D3 and fish oil, even though the data on fish oil is somewhat mixed. But then there are things like resveratrol and curcumin, which do fabulous things in lab animals and in vitro, but also have major bioavailability issues when humans take them—our livers basically chew them up, which is why there are relatively few positive studies in human subjects. I think we need much more (& much better) research on natural products in general. For me, exercise is my number one drug, and I also drink lots of water. Dr. Sara: As a writer, it’s fascinating to me that you mention the term “epigenetics” for the first time on page 194. This seems deliberate. Your choice or your editor’s? Why? Bill Gifford: Epigenetics, the study of gene expression (ie which genes are turned on, and off, and why) is a fascinating, emerging field of study. Epigenetics and the microbiome may have huge relevance to aging—it will. But we’re just starting to understand them. There’s an assay that’s been developed that can measure gene expression at the single cell level, which is mind blowing. Between that and the billions of bacteria that inhabit our microbiome, we’re looking at dealing with unprecedented amounts of data. Trying to make sense of it all is going to be the major scientific project of the rest of our lifetimes. I think we need “moon shot” projects to understand both epigenetics and the human microbiome. Dr. Sara: What are the most important aspects of boosting lifespan that no one wants to hear or do? Bill Gifford: As a society, we need to be spending much more money on research aimed at understanding aging. The National Cancer Institute has a $5.8 billion budget, compared to $1 billion for the National Institute on Aging. And within that, the actual biology of aging gets well under $100 million. So it’s almost impossible to get a grant, if you’re a scientist, and if you do get one—it’s going to be the safest, most “fundable” stuff, not your best idea. That has started to change, particularly with Google’s new Calico venture entering the field; they’re planning to spend close to a billion dollars in their partnership with AbbVie, the pharma giant, and they’ve also linked up with some other very interesting companies and researchers. So the future is very hopeful. For now, though, you’ve got to hit the gym or the yoga mat, and try and keep yourself together. Message from Dr. Sara: My friends, it’s time to slow down the aging process in your body. You may be in your thirties or forties, and wonder why that’s important, but I’m telling you that aging is a hidden process happening in the background for decades until you get a scary diagnosis—of breast cancer or memory loss or a degenerative disease. The time to act is now. 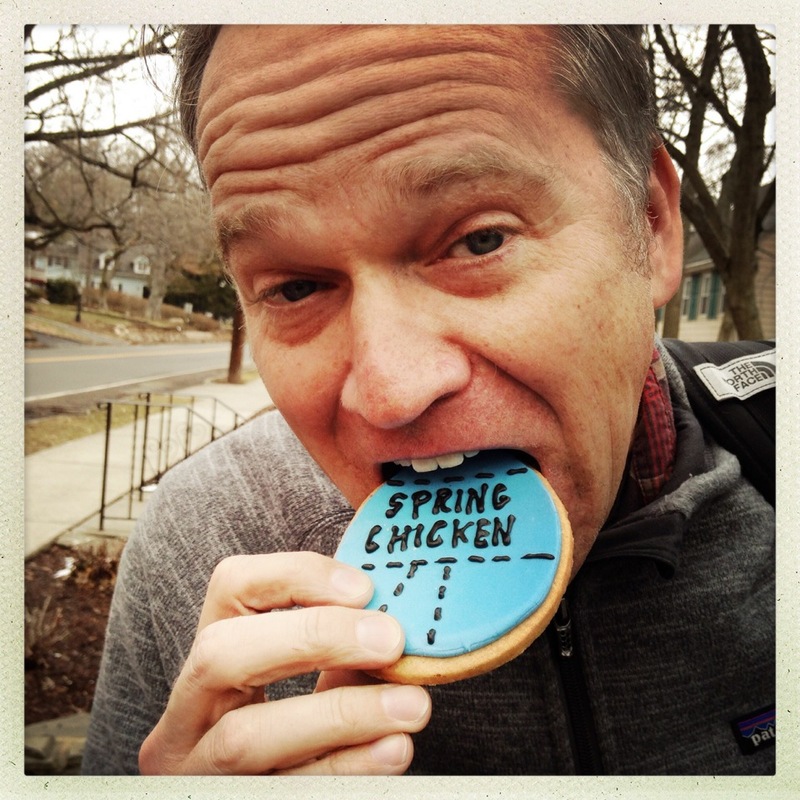 Start by buying Bill’s book, Spring Chicken, and laughing out loud while learning how to upgrade your aging body.